Born on September 18, 1997, Joy Lynn Michelle Carter had a birth defect called Spina Bifida (a neural tube defect that causes the spine to not close properly during development). The doctors did not expect Joy to live through the pregnancy, delivery, or the many surgeries. Joy lived much to their amazement for 4 months. She had many struggles but just as many triumphs. Her life was a testament of God’s love and healing power. Her name is what she brought to this world and it is the legacy she left behind January 15, 1998. Spina Bifida is something to live with not die from… we are dedicated to giving moments of Life to those with Spina Bifida. The medical community has made strides in giving every individual with spina bifida the gift of a full life and we celebrate that with offering opportunities to live it to the fullest. Because of joy supports summer camp, family camps and college scholarships along with other programs offered through our partnering organizations. For more information about Spina Bifida and our partners please check out our LINKS page. Jeff, Julie, Jeffrey and Jared are the foundation for because of joy. Each year Joy’s family works together to make sure that Joy’s legacy is experienced by many. Jeff handles all of the behind the scenes while Julie is more the visionary and front line person. Jeffrey and Jared started working on Tea for Joy when they were 7 and 4—each year their participation increases as they get older. Both of Joy’s brothers have found their place and have expanded the horizon of because of joy in their own way. 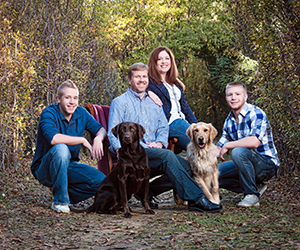 Joy & Spina Bifida impacted this entire family in such a positive way. It’s amazing to see a hard situation filled with such hope, joy and purpose. Even as the boys have grown up, their involvement and excitement for each event has increased to volunteering with the camp and with other organizations helping the Spina Bifida Community. Currently, the whole family spends a week at Summer Camp doing whatever is needed to help out and also volunteer at events held by the Spina Bifida Association of North Texas. Jeffrey lives in Minneapolis, Minnesota where he is working towards becoming a Firefighter and Paramedic. Jared is the reason we started Tee it up for Joy—our Golf Tournament and has been very influential in the building of the scholarship. Jared is studying Automotive Technologies at Southern Illinois University in Carbondale, IL. It is great to see young men with this much compassion and ability to communicate their thoughts and feelings about disabilities and watch them reach beyond their lives to find purpose in helping others. The entire family helps spread the blessing of Joy in a very personal way. Our family involvement reaches past Joy’s immediate family. Joy’s Aunts, Uncles, Grandparents and the Cousins she never met are all involved in a personal way. We feel as a family the responsibility to keep spreading joy into our community. Joy has truly started a work on earth and continues to inspire us.